"Yesterday is history, tomorrow is a mystery, today is a gift." I have used this saying so many times that it has become my personal cliche but it seems to fit the occasion. 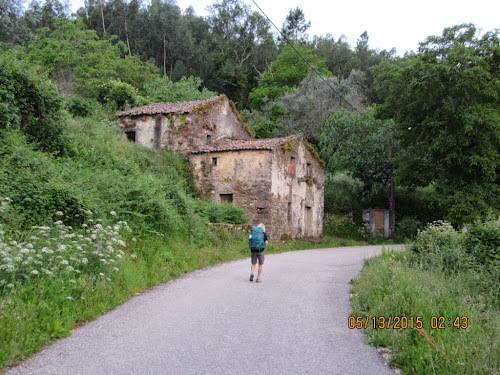 Today was a gift of an easier day on the Camino, not easy, but easier. 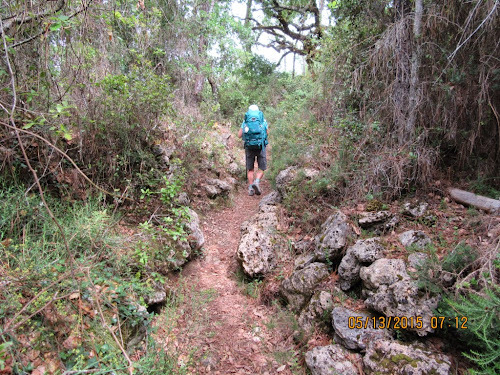 The varied terrain of today's route changed from quiet country roads, to soft pine coated wooded paths and to rocky scrubland trails along the crests of one hill after another which was a nice contrast to the days of pavement pounding we have been enduring up until now. Frequent Cafe stops were an added welcomed benefit too. At 5:40, as we headed out this morning, it was pitch black with only the city streetlights to guide our way but immediately they went out. By sheer and literal blind luck we walked straight to the albergue where we met up with John and Eman. Within five minutes daylight appeared. I was thinking how comical we must look to any local early risers who happened to look out their window; four pilgrims at an intersection all going in different directions trying to find the markers out of town. Markers were soon found and we headed up and out of town and I do mean up. We climbed up for the first hour of the day and then it was up and down all day but a gentle breeze and the haze filtering out the blaze of the sun meant it was all fairly pleasant. Around 8:45 we enjoyed a cafe stop; a tea and a decadent pastry which normally would I would consider a dietary disaster but, as we get into the rhythm of 33km days, a pastry is more medicinal than guilty pleasure. I didn't even share. 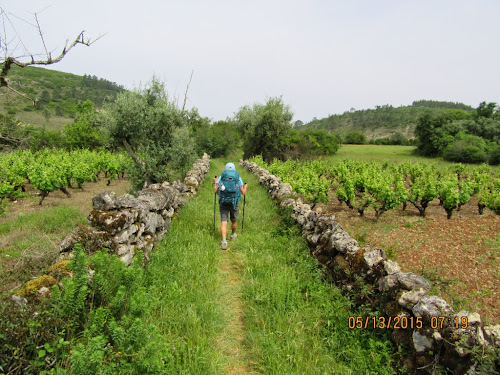 As we were leaving, three other pilgrims arrived, two gentlemen from Austria and a man from Switzerland, so the Camino group grows and it seems everyone is definitely doing their own Camino their own way. Some of the people we have met are taking shorter stages, mixing tourism with pilgrimage, some are taking taxis or busses to shorten the long days and others are sending their backpacks along to make these long walks a bit more tolerable. This got me thinking back to a book about pilgrimage that I had been reading recently and about the in-depth reference to and discussion of 'real' pilgrims. Reading those chapters, the term 'real' pilgrims sat uncomfortably with me, and with Dayton too. Who is to say what a real pilgrim is? When we first walked the Camino Frances de Santiago there did seem to be a definite hierarchy of pilgrims. Those who carried their packs and walked the entire route were given preference over those who sent their packs ahead by car or who took a bus or other transportation. Arriving at an albergue, if you hadn't walked the entire way from the previous stop, you might have to wait until the 'real' pilgrims arrived to see if there was a bed left available for you. But who is to say whose pilgrimage is more valid than anyone else's. Are you less of a pilgrim because you chose to miss the last five kilometres in 33C or if you send your backpack ahead to prevent further injuring a bad back or because you are ill? Unless you can walk a mile in someone else's shoes ( and if I ever do I hope they are a size larger than the ones that are now cramping my tender tootsies....but I digress), you cannot know their circumstances or intentions. The only one who might know if he or she is a 'real' pilgrim is the person themself; what is in their heart, their soul and their intention. The rest of us can let go of judgment. At the end of each day all we need to know is that we have done our best for that time, that moment. So now we are in Rabaçal with a full house at the Casa de Tourismo Residenciale, a very basic hostel with double rooms but no hair dryers. Does wanting a hairdryer make me less of a pilgrim? That might be a qualifier. We have a virtual United Nations of guests; the German couple from Bremen, John and Eman from Malta, Francisco from Barcelona who is a very patient Spanish teacher to me, an Irishman, a couple of other Canadians, ladies from Vancouver, and Dayton and I. We all agree that this was the best walking day so far on this Camino. 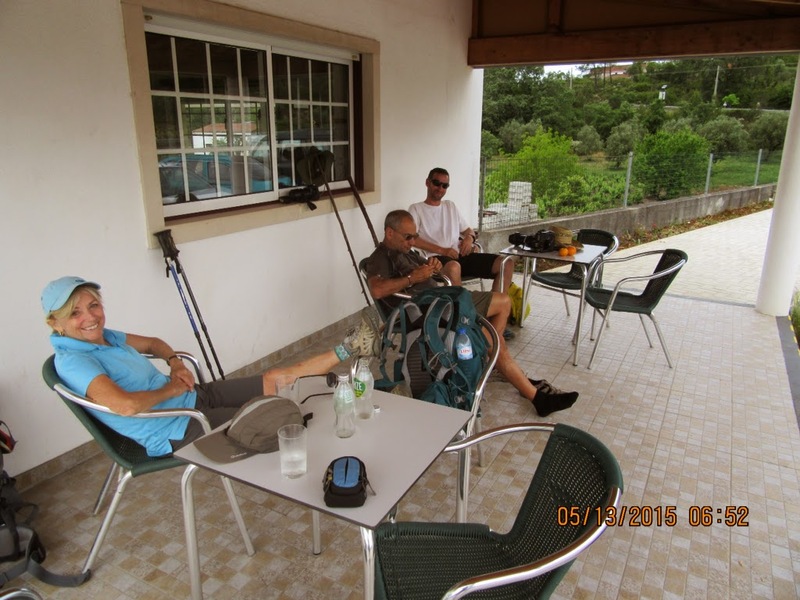 We finished this really good Camino day with a typical Camino communal meal. We all met up at the local restaurant. With all the many countries represented, Portuguese is the least spoken and understood language among us and that lack of understanding was reflected in our meal choices. The green vegetable soup was a delicious surprise so that was all good but the individual pizzas,that most of us ordered, were also a bit of a surprise. They were the size of a city street manhole cover and we all got a complete manhole cover to ourselves! I had never had a vegetarian pizza with just corn and peas on it. An interesting new combination. Of course the Portuguese service was typically and exceptionally friendly and generous. It has been a good day and, although tomorrow may be a mystery, there is no mystery about the fact that it will be another 30+km day. It will be long but, hopefully, just as pleasant as today. Break time with John and Eman from Malta. Hi Dayton, yes that would also be me trotting along behind recording the journey. What a time you two have had with the distances you have had to walk and the heat. You are two tough caminantes. Not sure I could handle it as well as both of you are. Glad today was just a wee bit easier for you. Karen, one of the reasons I've always liked your "Yesterday is a mystery..." saying is that the final part, "and today is a gift" has always seemed like a clever play on words to me. Specifically, you're talking about the past (yesterday), the future (tomorrow) and then finally, the present (today)... and of course "present" can also be a synonym for "gift". So it works on lots of different levels.